The Best Steak Rub EVER! This recipe is so simple to make and is perfect for pan seared or grilled steaks. 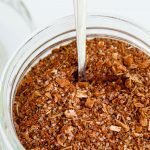 The dry rub contains salt for flavor, brown sugar for great caramelization, cayenne peppers for some heat, cocoa powder for richness and other herbs and spices to add an amazing deep savory flavor to your steak. It gives you a tasty juicy steak with a depth of flavour that is amazing. Any good steak rub starts with a basis of salt and sugar. After that the different herbs and spices are added to boost the flavor. A few oddities in there, but stay with me….I explain them all below. Yes! it is amazing in there, it adds a roundness and richness that just makes meat taste more meaty! It doesn’t make the meat taste chocolaty at all. It just adds great depth. 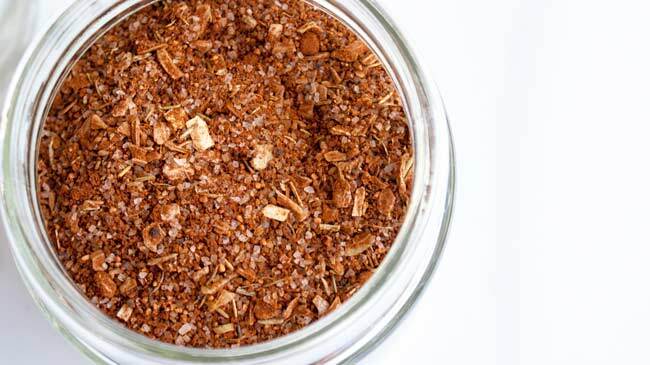 This adds extra salt and also more beefy flavor to your steak rub. It also helps with the great color on a grilled or seared steak. If you can buy it loose then that works perfectly here. Alternatively you can crumble up beef stock cubes. I prefer these to onion powder as they are less likely to clump together. But once you have added it to the rub, that problem doesn’t occur as easily, so if you only have onion powder then use that instead. This is just perfect for adding that steakhouse style smoke flavor. Just a hint, enough to remind you of the outdoor grill, without overpowering anything. How much steak rub does this recipe make? 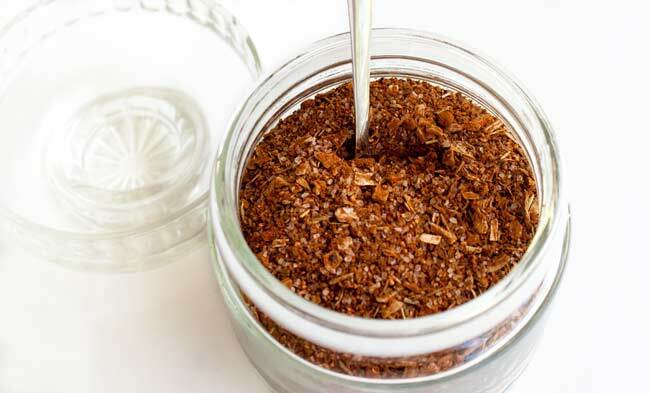 This recipe makes around one cup of steak rub which will be enough for 15-20 steaks. How long will this steak rub last for? 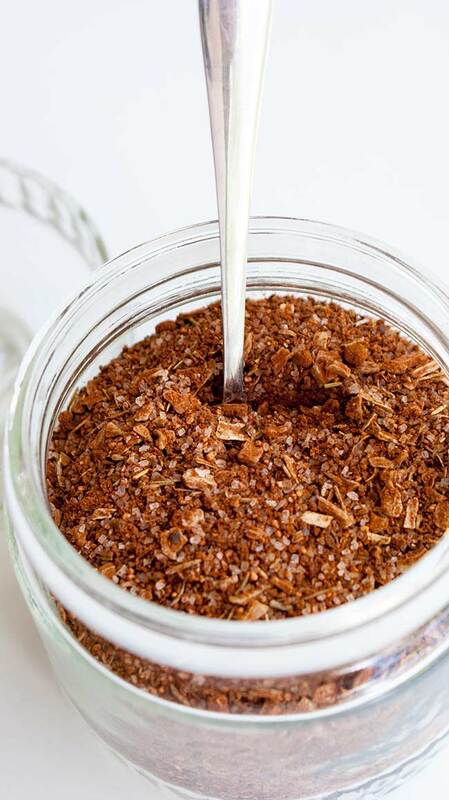 This steak rub keeps for months in an airtight jar. Although I find I use it much more quickly than that! If you live in very humid conditions you might find your rub starts to clump together after about 4 weeks. Just give it a good stir and use as normal. How much steak rub to use? I use 2 teaspoons per steak (we have eat large steaks). Rub it well into both sides of the steak and then let it sit for at least 20 minutes out of the fridge. Or I keep it in the fridge for 2 hours and let it come back to room temperature for 20 minutes. A splash of oil over the steak and a super hot pan or grill and dinner is minutes away. Can I use steak rub on anything else? We are having two gorgeous pieces of rib eye steak rubbed in this amazingness for dinner tonight 🙂 Perfectly cooked steak, some cheesy garlic butter potatoes, roasted tomatoes and garlic mushrooms and a glass of wine = a Saturday night that is worth staying up for. Pin this recipe for The Best Ever Steak Rub. Pin it here. If you LOVE steak and don’t want to use this rub then why not check out my Balsamic Butter Steak, it is so easy to make and tastes just like your favourite steakhouse steak! The Best Steak Rub Ever. 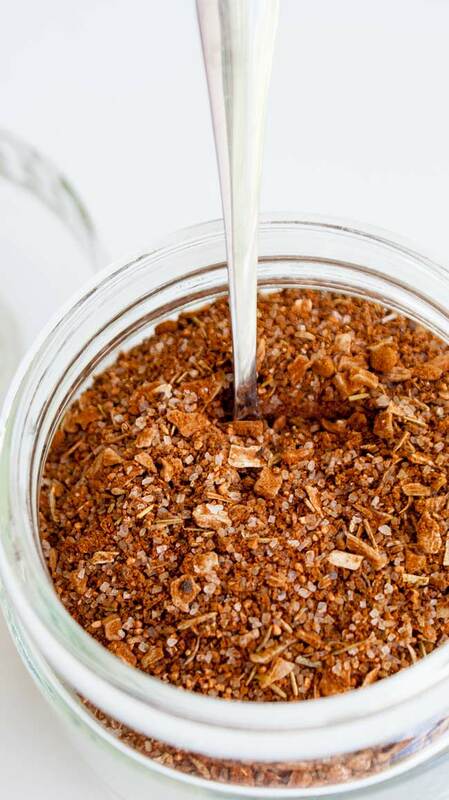 This homemade rub will change everything. It is that good. It is also great rubbed into chicken. Measure the ingredients into a large bowl. Use a fork to combine the ingredients and break apart any lumps. Rub 1-2 tsp of steak rub onto each steak. Really rub it in. You want to massage the steak so the whole steak is lightly covered in the rub. Cover and place your steak in the fridge for at least 2 hours. Remove your steak from the fridge 20 minutes before you want to cook it. Pat your steak dry and wipe off any loose rub. Add a splash of oil to each steak and rub it all over. Cook your steak to your individual preference. If you can buy beef bouillon powder loose, then you can add it o the rub when you mix everything up. If you don't have this as an option you can buy bouillon cubes and crumble them up. Or leave the beef bouillon out of the mixture completely and then when you want to use the rub, measure out your steak rub and add one cube per two steaks. This keeps for months in an airtight jar. If you live in very humid conditions you might want to make up a smaller amount so that your rub doesn't clump up. 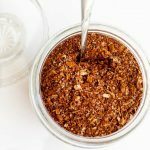 If you love food why not subscribe to my newsletter, I will drop you an email every now and then, just to say hi and send you a couple of recipes I think you might love, like this Best Ever Steak Rub. Mr 4 woke up before 5:30 this morning and being a person who loves her sleep I was not impressed! I got reluctantly out of bed and was a grumpy mummy! I was a grumpy mummy until I had my first coffee! But then I had more coffee, read him a story and he wandered off to play. So I snapped some pictures of this amazing steak rub. The light in my kitchen at 6 in the morning is perfect! What age do kids start sleeping in? Oh for the days when I have to try and drag them out of bed! Although I know when that day comes I will look back, wish they were still small and still bouncing out of bed. Motherhood….an ongoing contradiction. I made this up on Thursday night as I was taking the biggest tupperware of it to playgroup on Friday. The children decorated small plastic pots with Christmas stickers, then added the steak rub and sealed the lid on with some super cute Christmas tape. They loved it. Some decided to stick their fingers in and eat it, one super sweetie added some glitter to hers so Daddy had some sparkle 😳 and the floor got a pretty good covering! But they had fun and there will be some little pots of this steak rub in a few stocking this year. Christmas steak on the barbie, as it isn’t an Australian Christmas without a barbie. Thank you! I made this yesterday. It was AMAZING! We did not even need steak sauce because our steaks had so much flavor from the rub!! I will say that I was a little more generous with the rub when I put it on the steaks, but still have plenty more for future use. To anyone reading this and wondering if you should try it or not: TRY IT!!! Thank you so much for such a wonderful comment. 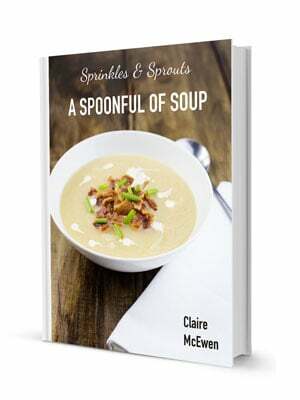 It always makes me so happy to hear people have used a recipe and loved it as much as I have. Do you think chicken bouillon would work well as a substitute for the beef bouillon???? Hi Alivia, although I have never tried it, I am pretty sure that chicken bouillon powder/cube would work just as well. I make a Mediterranean rub and use chicken bouillon powder in that with great success.